Perhaps no industry has seen more change recently than media, but what are the real factors shaping the evolution of the industry? And how do we design for them? Sumita Arora, one of Gensler’s Media Practice Area leaders, has a few thoughts. What are the biggest factors that are changing the way media spaces are designed right now? The biggest change is the transition to digital media, which, by its very nature, is social and collaborative. That collaborative aspect needs to come into the design of the physical space. When you create content, you need to be able to publish it across multiple platforms without having to rework it. And you need to get your story out fast, because today, anybody with access to a smartphone is potentially a competitor. Transparent news reporting is essential to the success of media companies such as The New York Times Company. If those are the factors changing the industry, how do we design for them? 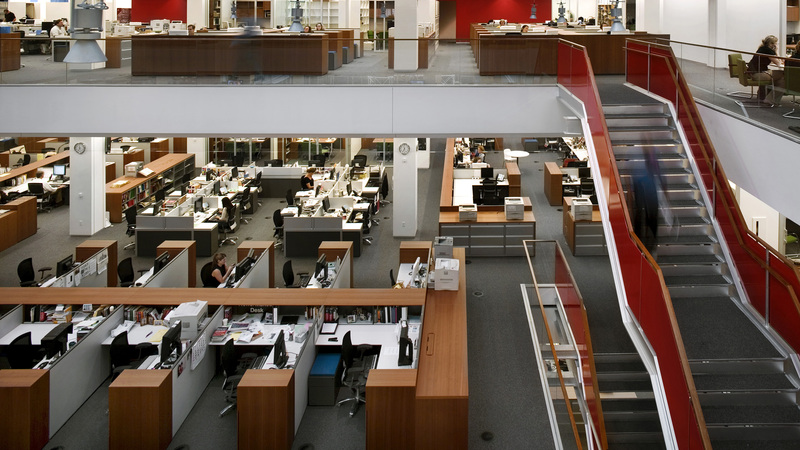 If we’re designing for the news media, at the center of the space is the hub where key editorial decisions are made. The space needs to allow for lines of sight and connectivity. Around the hub, there are a lot of media feeds so you see breaking news not just on TV, but on social media as well. Access not only to coworkers, but to information, is essential. As the media landscape continues to shift, teams need to adapt and work in non-traditional ways to create and distribute content. 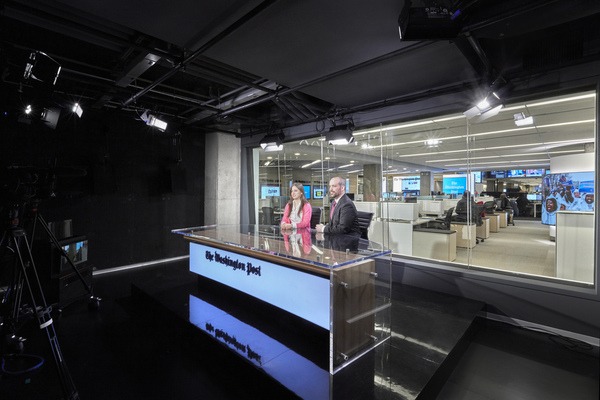 One of the things that we did for Reuters and the Associated Press was put them on a raised-access floor to create a completely modular workspace. Now, if they want to form a team around a particular election event, for example, they don’t have to redesign the whole space; they can quickly reconfigure their workstations and run with it. 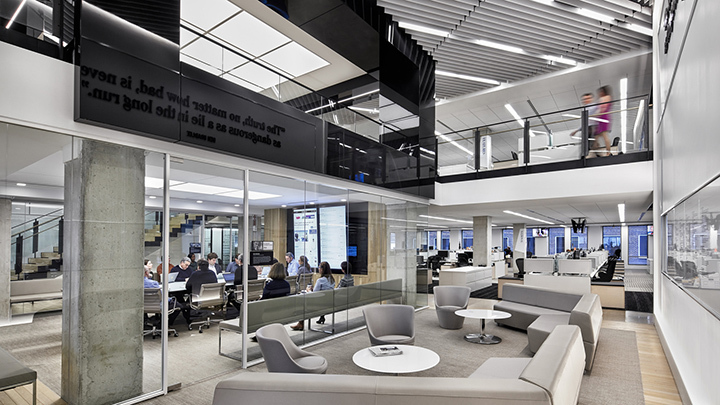 The design of the Washington Post breaks down barriers, and creates a natural flow between workspaces. So, we’re designing for process, but what about designing for production? Media companies want to be able to monetize everything they’re doing. For instance, if the Washington Post has a politician in their space, they don’t just want to go to print on that; they also want to produce a video, and they want to brand that video, so competing organizations will buy that content from them. That means you need to design an environment where you can create video from anywhere and the branding is automatic. That branding, in turn, helps build loyalty and let people know where the content is coming from. Other factors also come into play when you’re designing for this, like lighting and sound. Media companies want to be able to monetize everything they’re doing. That means creating a branded space where employees can go live anywhere. How has the inclusion of all these different concepts changed your approach to design? At the outset of any project, we do a visioning session to really get to the heart of the mission, the goals and the values of an organization so we can establish those high-level goals for a project. Now, we’ve modified our visioning process to really understand how the new media workflows are impacting the way that people work. Sunita Arora leads Gensler’s Media Practice Area with her colleagues Johnathan Sandler and John Wiedner. Her more than 20-year career in design spans campus planning, architecture, and workplace strategy. She has also worked in New York, London and New Delhi, India, where she ran her own firm.